The rapid growth of Russia, China and India, though not totally hassle free, will have implications for the global order. As the three countries grow rapidly, they need to coordinate their positions and sort out differences to play meaningful role on the international scene. In case of Russia and India, though both enjoy strategic partnership the economic content of that partnership is not robust. This was pointed out by the India President last week during the visit of Chairperson of the Council of Russian Federation, who led a delegation of Russian parliamentarians to New Delhi. As stated by the Indian President, Russia and India are gearing their policy mechanisms to double their trade to $20 billion by 2020. Also, the characterisation of the bilateral economic relations as defence centric needs to be transcended and the economic partnership must be diversified to other areas. There is an image, perhaps much hyped, that the economic relations are purely centered on arms and armaments. This image must be broadened to include other areas like energy, infrastructure, and consumer goods. In this context, the declaration by the Indian Minister of State in the Prime Minister’s Office last week that both the countries are cooperating on the space mission Chandrayaan-2 satellite for joint moon operation is an addition to this diversification kit. Emphasis should also be given to people to people contact. In case of India and China perhaps the problem is the reverse one. Though both the countries have a high record of trade, the political and cultural relations hang on a lower balance, which needs to be corrected. These three rapidly rising economies have the potentials to impact the global decision making. The question here is how far the leaders of the countries perceive the situation as propitious and how far the countries coordinate with each other. There are some positive signs in this respect. The meeting of leaders of the three countries in Moscow last month to deliberate on the issue of Afghanistan and their common position that the country should not slip into chaos and extremism is a case in point. The three countries have considerable stakes in Afghanistan. All of them are concerned about spill -over effects of extremism. The situation is very fluid as nothing clear has emerged about the prospects of stability after the NATO led International Assistance Security Force departs. The ascendancy of Taliban and the undermining of the Karzai regime gives rise to the fear of the return of the Taliban regime which none of the countries would prefer. Not only they have stakes in peace and stability, but also they have stakes in economic development of the country. Afghanistan’s proximity to Pakistan, China, and Central Asia, also areas of interest of Russia and India make the situation further significant for peace and economic development of all these countries. 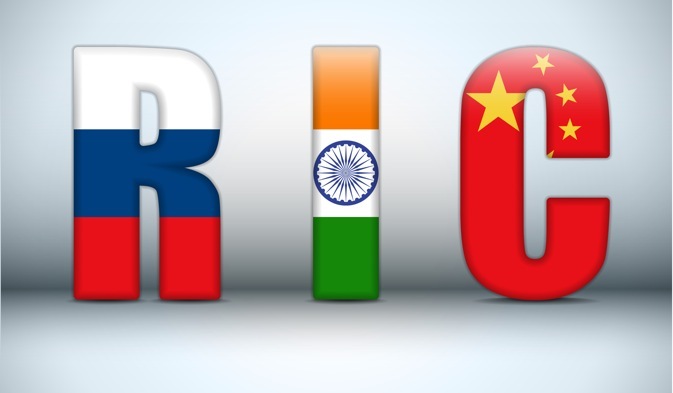 India, Russia and China are part of many forums like the Russia-India-China triangle, Brazil-Russia-India-China-South Africa grouping and Group-20. The three countries can form a nucleus of the larger groupings and provide direction to developments in international politics. For that to be realized, they have to develop a common framework through dialogue and deliberation. The Moscow meeting of the three countries on Afghanistan is a positive development in this regard. They can also play decisive roles in reform of international bodies like the United Nations or the International Monetary Fund, or in addressing international issues like religious extremism and terrorism, transnational crimes and drug trafficking, and international conflicts by minimizing differences and maximizing mutual understanding.